Good ideas... I'll be read'n um ! Is it only for soup or sea food? If you meat looked that good you would show it off too! I think its time we get that bbq brisket recipe. I think that you're correct Choopy. Scott contributes very little to this forum. It's high time that he become a useful member. I'm starting to wonder if he got those bbq meats from the Publix. So how about that recipe? Actually a little embarrassed about how easy it is. It is just a 2-3 pound pork roast from the end of a pork loin. I purchase the full sized ones at Sam's and butcher them myself. I take a full hands width off each end and turn them into roasts. Then take the center part of the loin and turn them into 2 inch thick pork chops. 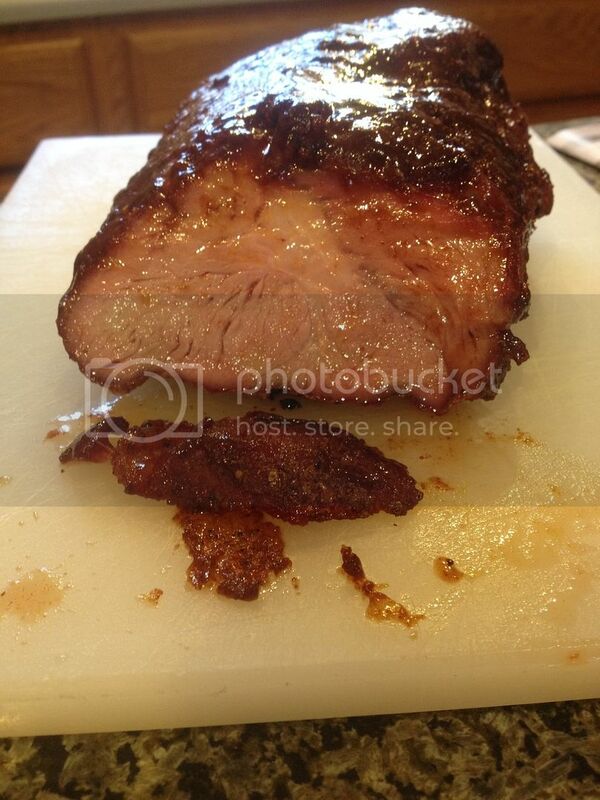 This piece of meat was rubbed with a local rub called Willy B's Bourbon rub. I smoked it to 145 then started glazing with a texas Pepper jelly until it reached 152 in the middle. Rest for 5-10 minutes and avoid eating all at once. Most people cook the crap out of their pork and taking it til the low 150's is plenty hot enough. Should have a little pink in the middle. Thanks, Scott I always have difficulty with large chunks of meat on the pit.